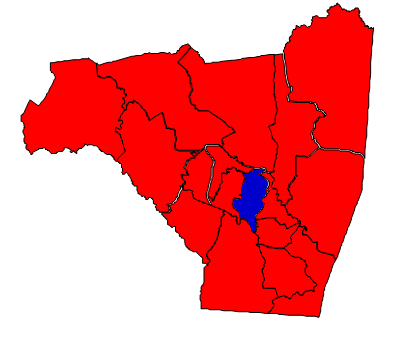 Rutherford County is located in the Foothills region of North Carolina. A rural county, the population in 2010 was 67,810. The county seat is Rutherfordton. The county was named for Griffith Rutherford, an officer in the Revolutionary War. Manufacturing continues to dominate the economy here. Losses in that sector, particularly in the textile industry, have the past two decades left the county with a persistently high unemployment rate. The county received some rare good news on the economic front when Facebook announced that they were locating a $450 million data center in Rutherfordton. It remains an open question whether or not Facebook can help turn around the county’s struggling economy. Politically, Rutherford County is solidly Republican. Not since 1976 has a Democrat managed to carry Rutherford in a presidential election. There was some lingering Democratic support at the local level until relatively recent, but this has practically vanished. Republicans control the Board of Commissioners and the county elected Republicans to the General Assembly. In Congress, the county is represented by Republican Patrick McHenry. Perhaps Rutherford County’s most prominent native son is Walter Dalton, former Lieutenant Governor of North Carolina and the Democratic Party nominee for governor in 2012. Despite his roots here and representing the county in the State Senate, Dalton lost Rutherford by over 13 points. Though Dalton still retained loyal support in his home county, this was not enough to overcome a Republican wave at the state level. Dalton was not helped by sharing the ticket with Barack Obama, who was highly unpopular in Rutherford County and won less than a third of the vote. Forecast: Rutherford County consistently trended Republican until 2012, when there was a slight trend in the Democratic direction. Once Obama is off the ticket, Democrats will probably do better here, though they will never be able to make the county competitive barring drastic demographic change. The Religious Right is strong here, and national Democrats have been losing the support of white voters in these Foothills counties for years. Though wary of Republican attitudes toward big business, the white working class voters that dominate the Foothills are now firmly in the GOP column. They will stay there until there is a major realignment. The county grew by 7.81% during the 2000s decade, which is below average. Rutherford is expected to suffer a net loss in population in the 2020 United States census. The racial composition of the electorate is steady. There is no data that points to anything other than complete GOP dominance here for the foreseeable future.